Scale: Strategical level. 1 hex=250 miles, 1 turn=4 month. 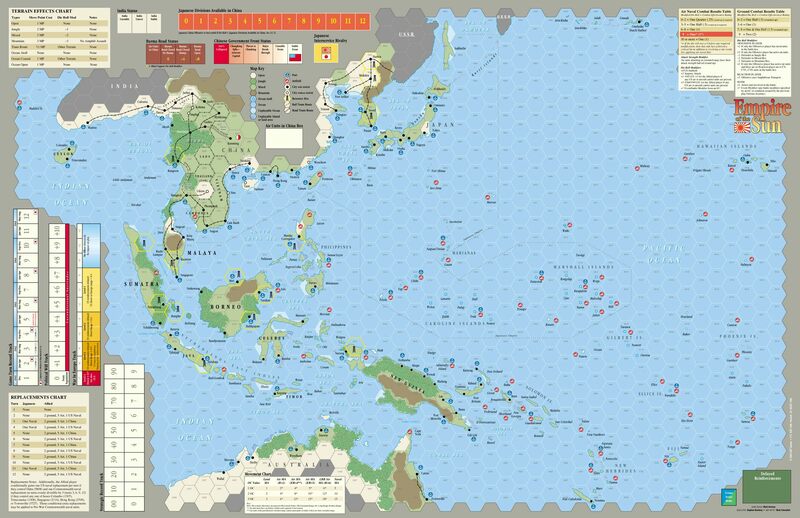 Empire of the Sun (EotS) is a strategic game of the Pacific War of World War II. It is a complex hex and counter consim with a card-driven mechanic. The most interesting aspect of PTO games is the approach to the Japanese victory conditions and how to keep the game interesting in the endgame. Pacific games often suffer from the fact that the Japanese historically couldn’t win the war and were heavily outgunned in the late war by the US, strangled by supply problems, and their ships and aircraft fleets almost destroyed. So there is always the danger that a game dealing with the PTO becomes quite boring for the Japanese player after his first (and last) initial strikes because he cannot react to Allied actions. A good example for this is Fire in the Sky (FitS) where the Japanese player is damned to watching the US “god fleets” take one island after another while the Japanese suffer from heavy oil shortages, unable to react to the US fleet movements. In the end game of FitS, the game gets even boring for the US player because his attacks are made on such ridiculous odds with utopian dice roll modifiers that he cannot lose a combat even if the Japanese spends his last valuable oil reserves to counter one of his attacks. This doesn’t mean that the US win all FitS games (they don’t, because their victory conditions are very sharply timed), but it’s always the US against the clock and not the US against the Japanese. Therefore, our main intention for playing Empire of the Sun was to see how this game deals with the Japanese end game issues and the question how a Japanese player can win the game – even if Japan couldn’t win the war historically. The designer’s notes of EotS admit that Japan couldn’t ever have won the war – but the Japanese player nevertheless can win the game by preventing US victory. And this works! Empire of the Sun is interesting and intense for both sides, up to the very last turn and last-minute of the game – there is always enough to do for the Japanese to take an active part in the game and throw obstacles in the US path. The graphic presentation of EotS ist great. The counters are detailed and clearly present all relevant information on a single glance. Icons and combat values are clearly visible. What’s missing is a better identification for the Japanese Marine Infantry because you have to memorize which units belong to the Marine infantry and which don’t. It isn’t much of a problem, though, because the number of units belonging to this troop is limited. The map shows the entire Pacific from Western India and Ceylon to Australia in the South to the Hawaii islands and Alaska. Unfortunately, the printed tables and charts are only readable for the US player because they are printed upside down for the Japanese player. It would be a better idea to print the table sideways so that both players can read them – but that’s a problem typical for many consims. The map is very detailed and shows many geographic locations, even if they are not relevant for gameplay. This offers enough chrome and provides profound knowledge of the Pacific island geography. All important information (terrain, ports, airfields, roads, rails and impassable ocean shelfs) are printed clearly and are readily identifiable. The Event Cards, which are the heart and soul of the game mechanics, are well-arranged and designed; besides the game relevant icons and information about level, card type and special rules, they contain historical background information about what is represented by this specific card, as well as an original black-and-white photo of the portrayed events. If you are a history buff, this is a very nice addition to an already deep and complex game, allowing you to recreate the Pacific War in a very detailed fashion. There is nothing I could complain about, the game looks very good. The rules contained in the game box are not up-to-date; the current rules version is 2.0 and they can be downloaded for free from the Publisher’s website (PDF download here, 5 MB). It is highly recommended to use the updated rules because they include all errata and clarifications as well as some rules changes. With 48 pages, they are quite extensive, even if they appear to be clearly arranged and comprehensible on first sight. In practice, during the first game, we realized that the arrangement and organization of the rules aren’t ideal because many aspects and topics are dealt with in at least two different chapters or different paragraphs in other contexts. Some rules are not where you would expect them, but in an entirely different chapter where they are easily overlooked. This leads to many beginner’s mistakes by overlooking vital rules, especially because the game is quite complex and requires a lot of memorization in the first place. Not everything can be deducted from charts, game tracks, tables, and aid sheets. The rules are not too difficult and once you learned the game, you can concentrate on learning (the quite demanding) strategy really soon, but initial access to the game is unnecessarily difficult due to the widespread and scattered rules. Besides this, the rules are formulated in a clear fashion, only very few aspects are unclear, confusing new players during the learning phase, and forcing him to search for answers on forums like the Empire of the Sun folder on Consimworld. You will get answers really soon, though, especially since the game designer himself is an active member of the forum. Some confusing rules we remember from our learning phase were the supply rules and some card texts (for example Japanese Event card 39), tiny map details (the status of Cam Ranh) or quite banal information we overlooked or discovered later because they were not where we expected them to be in the rulebook, but were compiled in a totally different context, for example the Long Range Bombers. Once the matters are settled and the rules are understood, EotS plays quick and comfortable and allows the player to concentrate on strategy alone without struggling with rules questions. The number of possible actions per turn is limited by the card hand and the elegant game design shines through after a very short while. Especially the interesting and exceptional abstraction models and the presentation of certain aspects of the Pacific War are outstanding. To cut a long story short: an extensive rulebook which makes learning the game somewhat difficult because of an unintuitive rules organization. Once you mastered this initial learning phase, the rules are unproblematic and there are almost no open questions – if you know where to look in your rulebook. Playability of EotS is great (except from the aforementioned difficulties when learning the game). The rules are coherent, the game is well-balanced, interesting and challenging for both sides – Allies and Japan alike. Both players are continuously forced to make hard decisions which is always a sign for a good consim design. In contrast to the Pacific game “Fire in the Sky” (FitS) there is no “downtime” for the Japanese player, the whole game through – despite his strict restrictions which can even strangle the Japanese if they encounter an Inter-Service-Rivalry (internal differences between Army and Navy). Nevertheless, the Japanese never is a toothless tiger – he can impede Allied play up to the very last turn and is always able to make annoying little counter attacks here and there. The card driven mechanic works very good, even if there is a small luck factor of which cards you get when, but this is true for all card-driven games – you either like that and accept it, or you don’t like it and don’t play these kind of games. The Event cards are separated into different categories and have political impact, allow for military offensives, offer supply and reinforcements or provide for counter offensives and reactions to enemy actions. How to play your card hand demands hard decisions and card play can be optimized with growing game experience. EotS follows a Sequence of Play where initiative decides who goes first in a given turn. Players get reinforcements and replacements. Allied reinforcements can be delayed because they are “sent to Europe” while the Japanese player has to decide whether he weakens his garrisons in China in order to move troops to other parts of the Pacific theatre. The reinforcement phase is followed by a Strategic Warfare Phase, where the Allied player can conduct (abstracted) submarine attacks on Japanese fleets and convoys and Strategic Bombing Raids on Japanese homeland. Next, players get strategy cards. Their number depends on certain game circumstances, for example the outcome of Strategic Warfare for the Japanese or which Allied nations have surrendered. In the Initiative Segment, the player with the most cards in his hand has the initiative. Players then alternate being the offensives player, playing strategy cards from their hands, conducting offensives or doing other actions depending on their cards. Players can react to offensives by playing Intelligence cards or Counterattack cards or other surprises (bad weather, attack canceled). The Offensives Phase ends when both players have played all their cards. EotS utilizes an abstracted politics system which is quite elegant. In this phase, players check whether control of certain crucial hexes changed during the Offensives Phase, and whether the Political Will in the US has dropped further. The Political Will is the true enemy of the US; once the public in the US becomes tired of the war (due to heavy losses and other events), the US defeat draws near. Supply status of all air and ground units is checked. If a unit is out of supply and out of HQ range, it looses steps and becomes combat-ineffective. In this phase, all track markers are adjusted (and there are quite a few). If the US Will ever drops to zero, the Japanese player wins the game. If it is the last turn of the game, the winner is determined according to the campaign or scenario victory conditions. All in all, EotS is a game where experience leads to better performances. You realize your strategic errors during your very first games (for example supply and HQ activation rules and how it hurts to put entire fleets out of supply AND HQ range, or to leave a single, lonesome HQ without protection in enemy range). In addition, it is famous for being one of the most well-balanced games ever published. In our first game, we made numerous beginners’ mistakes and felt the consequences almost immediately. The learning curve is very steep and after a few games you have drastically improved your strategy. The game allows many decisions and variants, which, combined with an unpredictable card hand, leads to a very varied game. You are constantly learning and improving your strategy by mastering very difficult situations. While the game was in our HFC test lab, I played my games as the Allies and was constantly struggling with the “US Will” which symbolizes war fatigue and morale at the home front. To keep the Will as high as possible is crucial for USA strategy – because if the Will drops to zero, the US offer the Japanese negotiations (which is a moral victory for the Japanese, even if they lose the war as such). A Will higher than zero symbolizes the demand for “unconditional surrender”, so it is the Japanese’s main directive to target the political Will, in fact it’s the only way the Japanese can win the war actively. The US have victory conditions of their own which are very difficult to fulfill in the course of 12 turns – the re-capturing of all strategic hexes and continuous strategic bombardment of Japan or an invasion of the Japanese home islands and conquest of all Japanese cities on the main island. The combat system which utilizes various Combat Result Tables (CRTs) is very interesting and gives valuable historical insight in the questions why mixed formations of naval and air units and infantry were vital to Pacific warfare, especially regarding “island hopping” in the Pacific ocean. Instead of the usual combat odds, the game uses an “Efficiency Rating” which doesn’t add the combat strengths of all opposing forces but takes a separate look at both sides, judging their individual efficiency in a given combat. Losses can be quite drastic which represents the “bloodiness” of the Pacific war. The game presents the war from a very high strategical level and uses very useful, comprehensive, and elegant abstraction models which work fine. The playability of the game is perfect and works great after a few introductory games. The replay value is very high, especially because of the card-driven mechanic which provides for very varied gameplay. No game is like any other, each game depends on which cards you get and which keep you waiting for a long time. In addition, there is an immense amount of maneuver and detailed troop movement. Last but not least, the game allows for testing various strategies (“what if”) and experimenting. In contrast to the somewhat static Fire in the Sky where movement possibilities are almost “scripted”, EotS allows constant experimentation with new and even uncommon strategies by switching focal points and offensives targets. Basic problems, like the US Will, require solutions and there are numerous ways of how to “play the Will”. You have to learn to use the strengths and weaknesses of your side and to compensate for them and a defeat always inspires you to do better in the next game and to concentrate on aspects which broke your neck this time. EotS is a game you want to set up again immediately after finishing a session. Traditional and conservative players can enjoy the game as can experimental gamers who want to optimize and test various and uncommon strategies. EotS is a classic hex-based, card-driven counter consim with some interesting special aspects. I didn’t play any other Mark Herman games besides this one so far, so I cannot judge whether the specifics are typical for him and used in other games as well or whether the combat system is unique. Nevertheless, I played many other strategical level hex-and-counter-consims and I can say that I never encountered such an unusual combat system before. So to me, it is unique and a very challenging experience. In every other game I played so far, players calculate the odds of their armies against their opponent’s armies, whether by adding up combat strengths or using other methods. A combat system where each side is dealt with individually and the combat system only refers to their efficiency in combat, needs getting used to. The die only shows how efficient the given combat strength is used in the combat. After a short while and some battles later, you recognize a certain elegance in this unusual combat system which forces the player to make difficult decisions and risk assessments, but also allows him surprising attacks. I enjoy this uncommon combat system very much! Headquarters are much more important than in other strategic games. They are not only commanding their subordinate units, but they also include some abstracted elements such as supply, resource management (unlike the infamous oil and transport points in Fire in the Sky) and the generally difficult command and communication situation in the vast area of the Pacific. Mark Herman deliberately abstained from including a limiting resource management system into the game and abstracted these aspects in the HQ rules. It takes some games to understand the depth and scope of this abstraction model. It simplifies and accelerates gameplay without sacrificing strategic depth or neglecting these important aspects – they are combined in a very creative fashion. High. EotS is so detailed that it allows specific studies of the Pacific war. Besides the most important battlefields, the game includes many small islands and atolls and there is much maneuvering. The game simulates and abstracts many aspects of the Pacific war and is a helpful tool in answering “what if”-questions and trying out alternative strategies. The game allows to replay the US and Japanese strategies or to “do it better” than they historically did. The level of detail is high enough to make EotS a very good simulation which is supported by the fact that there are many in-depth strategy articles based on this game (for example the importance of US air operations, using the example of the island Truk). Players who are interested in history will be very happy with EotS. You can play the game solitaire, but the game experience will be limited because of the card-driven mechanics and the loss of surprising moments. Knowledge of the opponent’s cards and the possibilities to react to these cards allow for a much more determined attacks or inhibit risky and experimental maneuvers. GMT Games state that the game has “medium solitaire suitability”. It is certainly sufficient enough to historically study the Pacific war, great maneuvers, fleet movements or single battlefields. Fire in the Sky. Looks great, but gameplay is quite static. Other Pacific games of a similar scope. The Japanese game Fire in the Sky by Tetsuya Nakamura (MMP) is not very complex and uses point-to-point movement. In contrast to EotS, gameplay is very static without much variety. Other similar games are War in the Pacific (DG), Asia Engulfed (GMT) or Mark Herman’s Pacific War which is more complex than EotS because it includes resource management and much more detail. He is currently working on a new edition of that game. We mainly compared EotS with FitS because we wanted to know how the drastic gameplay problems of FitS are solved in other games dealing with the Pacific war. Because of that, we used FitS as our main reference game, even if is much less complex and strategically limited. There are even some parallels in gameplay, for example in the attack sequence which starts with air combat, followed by surface naval combat and finally ground combat. In contrast to FitS, EotS offers much more depth, variety, options, and has a much higher simulation value. In the course of our Pacific War studies we will compare other Pacific games as well, how they portray the historical situation and how they deal with the “victory for Japan” problem. Once we tested another Pacific game, we will add some comparative information. It took only a short time – and then EotS became one of my favorite consims. After some initial difficulties and resentments over the rules organization, this resentment soon was replaced by enthusiasm about the elegant system and the enormous depth. The game definitely is one of the most thrilling consims on strategical level in our games collection – the pressure on both sides is very strong throughout the entire game, the victory conditions are very difficult to fulfill, especially for the US and the timing is very sharp. Playing the game “under par” requires an invasion of the Japanese home islands, which also would have been the final option for the US historically. Keeping up the US Will requires capturing 4 locations each turn (sometimes even forcing you to attack targets which are actually hindering your overall strategy and which drain your valuable resources – just to placate the people at home). The Japanese apply merciless pressure on the US when they are targeting the Will, always attempting to break US morale. This is achieved by political interaction and the conquest of countries which are then used against the Americans. As an Allied player, I feel under constant pressure – the time limit is very harsh as are the victory conditions, and the Will is constantly threatened and dropping. The combat system, which was very unfamiliar in the beginning, proved to be very interesting after only a short while, and demanded tactical decisions we didn’t know from games which use combat odds to determine the outcome of a battle. This added an interesting and thrilling new aspect to the game. The infamous downtime for the Japanese player doesn’t exist in EotS. Even if they lose the bulk of their fleet or if the US takes one island after the other from them (with bloody losses for both sides), they always remain capable of action, can impede the Allies up to the last turn and hinder their progress. Annoying little operations which target the Allies’ weaknesses on their way to Japan are always an option for the Japanese player. The Option Cards provide for surprises – and can even ruin the long-planned final offensive where the US even sacrified the Will for one turn, gave up other important locations and concentrated huge forces in one place. An example is the monsoon which can end an offensive without a battle and which can hurt the Allied player very much. In addition to replaying the historical war, the game offers the freedom to diverge from the “historical corset”. But the general framework of the war is fixed, so you always can experiment with “what if” questions without drifting off to abstruse experiments. In contrast to this variable framework, Fire in the Sky scripts the Allied advance almost island for island, so that it’s almost impossible to divert from the standard plan. This game doesn’t show any surprise moments of where the enemy moves next because movement is limited by the very simple “no amphibious landings within 2 hexes” rule. Empire of the Sun, on the other hand, offers much more possibilities for maneuvering, surprises, and excursions. You always have to watch out that you keep your units in Headquarters range, but that’s not a problem for the US because especially the HQ in Oahu with its 25 hexes range provides for spontaneous capturing around the Japanese islands if there is a gap in the Japanese defense lines. More than once I was able to get a foothold on Iwo Jima without capturing the Marianas first – something which is unthinkable in FitS and even forbidden. Both sides have a wide scope for alternative strategies and a large assortment of potential targets and routes across the Pacific. Not even the British who are mostly limited to ground combat in Burma and Malaysia are trapped in a too tight corset – even if they don’t move towards Japan very often. In FitS their amphibious capacity is limited by the low number of available transport points so that any sea movement with a strong British army is almost impossible, and they are forced to move on foot from Rangoon to the South. In EotS, the British can conduct amphibious attacks, if they like to, and their progress on land depends on many tiny details, for example the Chinese, the Bridge over the River Kwai, the Burma Road and other factors. Naturally, the British gameplay is more static than the US, but the game nevertheless gives you at least the opportunity to experiment with the British army and navy, whether you want to use it or not is up to you. The fact that resource managementt is abstracted in the form of headquarters, so that you doesn’t have to count oil points and such, doesn’t have any negative impact on game depth. The gameplay and strategy are very deep, but the abstraction model diminishes the amount of work and bookkeeping. Nevertheless, you have to get used to this abstracted resource management concept; it is quite confusing in the beginning because the HQs become more important than we were used to and we didn’t understand what was symbolized by a HQ counter – until we got the concept behind the HQ design in a discussion with the designer on CSW. We were very surprised that even units located on the ultimate supply source (=cities in their home countries) could be out of supply if not in HQ range. Mark Herman explained that the HQ is much more than something which supplies troops with oil, food, and other stuff. This means that an Australian unit in Australia can suffer from attrition effects if it is not in HQ range. This doesn’t mean that the soldiers die of starvation or anything like that – the HQ is far more than that, it is the general logistic infrastructure needed to keep a military unit together. This means: something like the Australian soldiers prefer to go surfing on the beach instead of remaining in the barracks if no one’s there who gives the orders. The HQ system also limits the Japanese advance; if the Japanese player is too expansive, they are forced to leave one HQ near Japan to enforce military cohesion and supply. So HQs symbolize oil points, transport points, and everything else which is handled manually in FitS and many other games – but in a very clear and sometimes very drastic way. EotS also makes the importance of some “naked rocks” in the Pacific clear where both sides battled for months. Especially the importance of airfield control for general control of the Pacific is an important lesson learned by playing this game. EotS is a very interesting, complex, varied, deep, enjoyable game of the Pacific War which keeps both players in the game until the end because of the card interactivity and reaction possibilities. Victory conditions are harsh, as is decision-making for both players. Battles are bloody and the results often hurt. This entry was posted on July 14, 2010 at 11:46 am	and is filed under Empire of the Sun, Historical Games A-Z, Reviews. Tagged: Empire of the Sun, GMT Games, Mark Herman, Pacific war, PTO, Review, World War II. You can follow any responses to this entry through the RSS 2.0 feed. You can leave a response, or trackback from your own site.